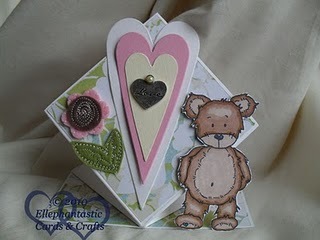 Mid Month tutorial & inspiration time at Ellephantastic Challenges blog.. This month we have a great tutorial brought to from Clare & for added inspiration the DT girls & I have all made a card using Clare's tutorial & my images. Pop on over now for a look. PM papers - sorry I forget which! A real cutie of a card - lovely. If you would like to be in with a chance to win a crafting apron please pop over to our shop blog and leave us a comment.